Take smartphone photography to the next level with Huawei P30 Series, now available for pre-order with great offers at Smart. Huawei P30 Series raises the bar in mobile photography with their impressive camera technology, featuring the world’s first Leica Quad Camera System, 40MP SuperSpectrum sensor, 10x Hybrid Zoom, and more cutting-edge pieces of camera tech. The highly anticipated duo, the Huawei P30 and P30 Pro, definitely deliver Huawei's claim to "rewrite the rules of photography." Experience the groundbreaking mobile photography for your life's greatest moments with the Huawei P30 series, now available for pre-order at Smart Stores nationwide and on the Smart Online Store until April 12. 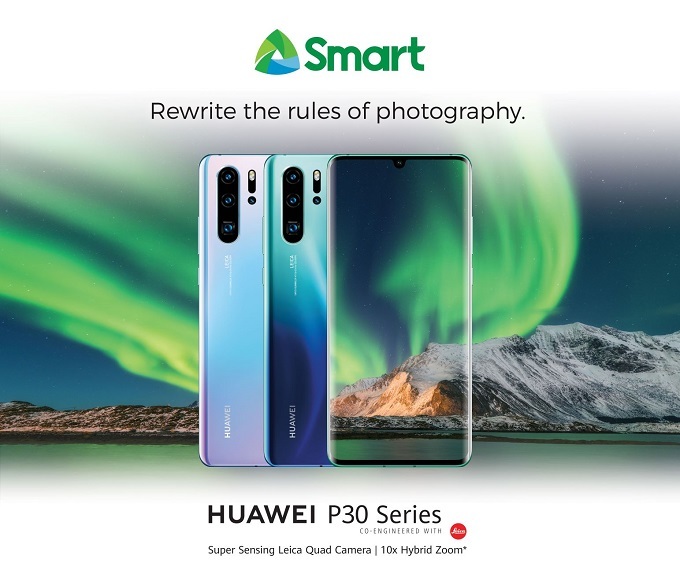 Smart offers the Huawei P30 Series under the data-packed postpaid plans. Every Huawei P30, P30 Pro Pre-order will get a Huawei Watch GT Active worth Php 12,990! Get the Huawei P30 Pro at Php 2,399 per month (with a one-time cash out of Php 9,010 for the device); the Huawei P30 at Php 1,799 per month (with a one-time cash out of Php 5,690 for the device); and the Huawei P30 Lite at Php 1,199 per month (with a one-time cash out of Php 2,010 for the device). Designed to “rewrite the rules of photography,” the new Huawei P30 Series brings ultimate perfection to your photographs. The P30 Pro gives incredible night-shots, up to 10x hybrid crystal clear zoom, and smooth stabilization technology through the world’s first Leica quad camera. This super camera system has a 40MP Super Sensing Camera, 16MP Ultra-Wide-Angle Lens, and an 8MP telephoto lens. With Smart, you can optimize Huawei's latest smartphones thru the country’s fastest LTE network, based on third-party studies by international firms. World-renowned mobile internet speed testing firms such as the US-based firm Ookla and the UK-based firm Opensignal recently awarded Smart as the country’s fastest mobile data network. In February, Canadian crowd-sourced mobile data company Tutela found Smart as the country's leader in terms of network 'consistent quality. Be among the first to experience Huawei’s latest flagship smartphones by pre-ordering at the nearest Smart Store, or on Smart Online Store.